This review covers the 3rd edition with the last paragraph summarizing changes in the 4th edition. The destroyer U.S.S. Drexler (DD-741) sunk off Okinawa in the early morning of May 28, 1945, after being hit by two kamikaze planes. The ship went down 49 seconds after the second kamikaze plane hit the ship, and 158 men lost their lives. Four decades later, survivors from Drexler's sinking met together for the first time for a reunion in Charleston, South Carolina. Charles Brown, son of deceased survivor Donald Brown, compiled this Historical Review, and Robert Anteau, Fire Controlman Third Class on Drexler, edited the third edition of this book. Many of the destroyer's 199 survivors contributed stories and photos contained in this privately published book. Robert Anteau, U.S.S. Drexler (DD-741) Survivors Reunion Association Historian, created the first edition in 1986 and compiled a second edition in 1993. Historical Review: U.S.S. 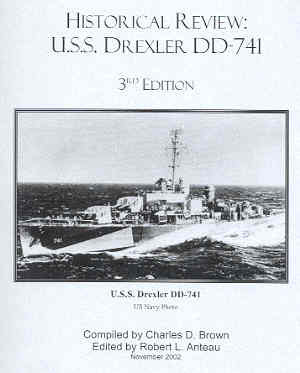 Drexler DD-741 contains various official Navy records, survivor recollections, crew and ship photos, and other short pieces about the ship's history and the activities of the U.S.S. Drexler (DD-741) Survivors Reunion Association. The book presents information in chronological order, but it does not have a narrative of the ship's history from beginning to end. Highlights from Drexler's deck log describe the ship's activities from November 14, 1944, the date of her commissioning, to February 25, 1945, two days after she departed Pearl Harbor. The deck logs for the remaining three months of Drexler's short service were lost when she sunk, but the book tries to reconstruct this period through survivor recollections, the Captain's abbreviated Action Report written in July 1945 for this period, and log information from ships working with Drexler. Over 30 survivors of Drexler's sinking give their recollections of the events of May 28, 1945. These stories tell of the crew's horror and shock as the ship quickly sank, oil burned on the water, and the men swam or held onto a raft until rescued by smaller support ships on nearby patrol. These personal accounts, along with several official Navy documents that summarize the day's events, depict the suddenness of the tragedy. Many men died below decks, since they had no time to escape as the ship sunk in less than a minute after the second plane strike. The survivor stories also give several examples of how crewmembers would have died unless they had been helped by their shipmates. In the early morning of May 28, 1945, Drexler, destroyer Lowry (DD-770), and two LCS(L) (Landing Craft, Support (Light)) vessels patrolled Radar Picket Station 15 to the west of Okinawa. The times and plane types of kamikaze planes that attacked Drexler differ slightly between official accounts of the different ships, and survivor stories also have a few additional and conflicting details when compared to official accounts. CAP (Combat Air Patrol) detected six Japanese planes flying toward Picket Station 15, and CAP planes downed one twin-engine Nick. A twin-engine plane flew directly over Lowry, missing her overhead by a few feet, and recovered just over the water to strike Drexler between the main deck and waterline on the starboard side. Guns from Drexler and Lowry quickly downed two other twin-engine planes. About five minutes after the first kamikaze plane hit Drexler, the fifth twin-engine plane, hit several times while being chased by two Marine Corsair fighters and shot at by Drexler's gunners, passed over the ship at about mast height. The Japanese pilot made an amazing rollover with the smoking plane a few feet above the water and brought the plane around to crash into Drexler's #2 stack. The destroyer sunk within a minute of this second kamikaze strike. CAP planes shot down the last plane, a twin-engine Nick, after Drexler sank. Drexler's small group of survivors, along with Charles Brown as the compiler, united to put together this excellent history for former crewmembers, their family members, and friends to remember their ship and her sudden sinking. Although not written by professional writers, Historical Review: U.S.S. Drexler DD-741 provides much valuable historical information and many personal recollections, both moving ones related to the ship's sinking and lighter ones about life aboard ship. On May 28, 1990, the younger brother of Robert Rosenfield, one of the men killed, arranged with the U.S. Navy for a 1,500-lb. marble marker to be dropped at the site of Drexler's sinking. This marker, engraved with the names of his brother and the other 157 men who perished, serves as an underwater memorial to Drexler's crewmen who made the ultimate sacrifice. The fourth edition of Historical Review: U.S.S. Drexler DD-741 published in 2007 contains all information in the third edition with some additional details. The main additions are the two articles Who Sank the Destroyer Drexler? and Censored Suicide, which tells the personal story of the tragic suicide by the wife and two children of the Japanese Army First Lieutenant who led the special attack squadron that sank Drexler. The fourth edition also contains several more photographs of crewmen contributed by family members.